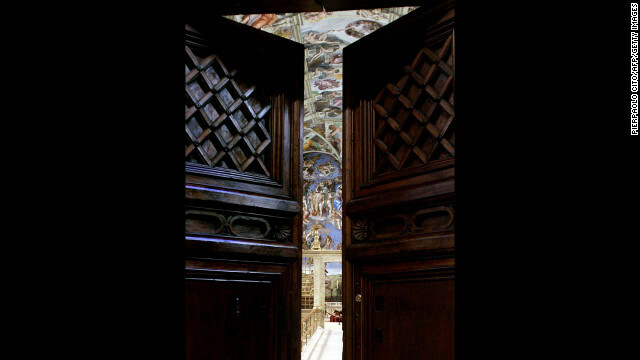 Michelangelo's "The Last Judgment" is seen through the Sistine Chapel doors on April 16, 2005. The painting, on the wall above the altar, was completed in 1541. Electing a pope: What's taking so long? Rome (CNN) - In and around the Vatican these days, there's one question everyone keeps asking: When is the conclave to elect the new pope going to start? The cardinals of the Roman Catholic Church aren't saying, but they're sending a clear message: They will not be rushed. As of the seventh day after Pope Benedict XVI flew off into the sunset, the voting cardinals hadn't even all arrived in Rome, leaving the world wondering what's taking so long. But don't be fooled. The conclave matters, but it isn't the only game in town. What's happening now is at least as important. Since Monday, the princes of the church have been meeting in what are called General Congregations - closed-door discussion sessions where all of the world's cardinals can talk about whatever is on their mind. Think of it like this: If the conclave is the presidential election, the General Congregations happening now are the primaries - or the caucuses held every four years in Iowa, where friends, neighbors and coworkers meet and discuss why they think their candidate would make the best president. The conversations won't be that nakedly political, but everyone in the room is sizing up everyone else as they discuss the issues facing the church. Some of that happens over coffee breaks, as one Vatican spokesman hinted on Monday, the first day of the General Congregations. "There's a coffee break for about 30 minutes at a special buffet area in the front part of the audience hall," said the Rev. Thomas Rosica. "Cardinals have an opportunity to go down and mix and mingle." The cardinals aged 80 and over, who are barred by Church law from voting for the next pope, do get to participate in the General Congregations. It's their only chance to set the agenda. "They want to say what the next pope will hear, because he's probably in that room, and they also want to alert the people who haven't spent so much time in Rome just what the situation really is here as they see it," Cardinal Francis George of Chicago said. Cardinal Jose Saraiva Martins, who participated in the conclave to elect Benedict XVI but is too old for this conclave, said the groundwork is laid during General Congregations. "By the time the congregations are over, you have a clear idea of who can deal with the problems we've discussed," he said on Sunday. The cardinals under the age of 80 who elect the pope continue evaluating each other once the conclave begins, Cardinal George said. "You take people aside and say 'Now, in the balloting today, so-and-so had support and I wasn't even very much aware who he is. Tell me about him," he told CNN before the General Congregations started. But they want to go into the conclave with pretty clear ideas about who should be pope, Cardinal Sean O'Malley said at a news conference Tuesday. "We want to have enough time in the General Congregations so that when we go into the conclave it's a time of decision," the Boston cardinal said. "This is a time of discernment and prayer and reflections," he said, referring to the General Congregations. "Many cardinals are concerned that if there is not enough time spent in the General Congregations then when we get into the conclave it could drag on," he said. "If you cut short the discussions, the conclave could go on and on and we really prefer to have the discussions done before," he said. And how long will the discussions take? Cardinal Daniel DiNardo of Galveston-Houston, Texas, answered that at the same news conference on Tuesday: "It takes as long as it takes." T*I*T*L*E*:"Electing a pope: What's taking so long?" Is there a problem with Catholics being elect?? Illinois has that problem with their PUblic Servants. They get elected , then convicted. God's way is to convict, then elect. Don't bother viewing this video, it's garbage, just like all the others. This poster is just trying to get hits for their youtube site.